HEIGHT: 25 to 50 feet. 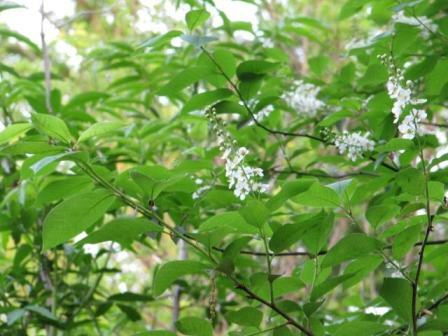 It has been reported to grow to as much as 100 feet in the deep, acid, sandy soils of east Texas. NATURAL HABITAT AND PREFERRED SITE: In far east Texas, the Hill Country and the Trans Pecos in west Texas. 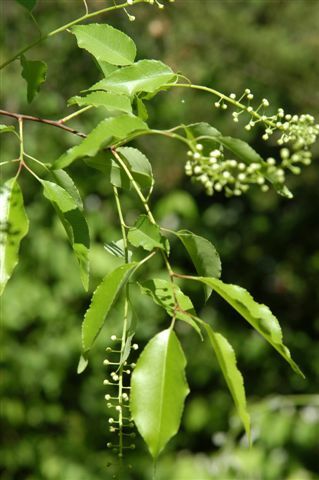 It is commonly found in full sun in fencerows, thickets and on the edges of woods. 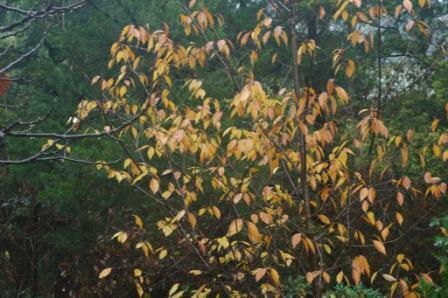 Black cherry can grow in sandy to rocky alkaline soils. 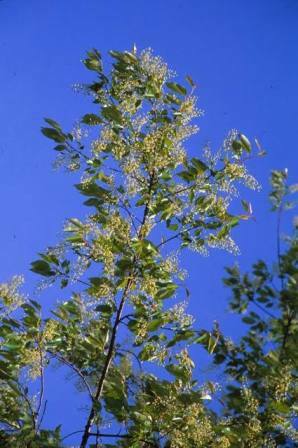 IDENTIFICATION INFORMATION: Black cherry is a medium sized tree, capable of growing to great height but normally stays under 50 feet. It develops a narrow crown with a single, slender trunk with open branching. Beautiful shiny foliage. FLOWERS AND FRUIT: Blooms form in spring as the leaves emerge, usually around March. Flowers are pure white and about ¼ inch in diameter with 5 petals. The thick skinned fruits (droops) ripens June to October. They are black when mature but all shades of cherries will be present on the tree at the same time – black, red and green, sometimes within the same cluster. BARK: The bark is a reddish brown to gray, smooth when young, but becomes heavier textured with age. FOLIAGE: Leaves are simple, alternate and deciduous. 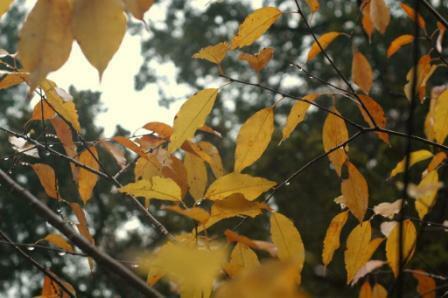 Yellow fall color – sometimes very spectacular. CULTURE: Black cherry can grow with minimal maintenance in a wide range of soils. PROBLEMS: Thin bark is easily damaged by fire. Tent caterpillars sometimes attack and black knot fungal galls sometimes disfigure limbs. PROPAGATION: Seed germinate best after stratification at 41 degrees for 30 to 60 days (or even longer) prior to planting in the spring. It can also be grown from semi hardwood and softwood cuttings taken in the summer. Another method is to soak the seed in a diluted acid solution or vinegar can work for a short period of time before planting. Seeds germinate easier after passing through the digestive system of some animals. 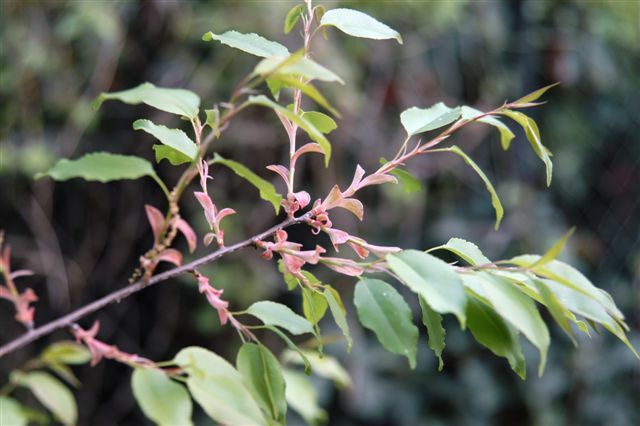 INSIGHT: The escarpment black cherry is Prunus serotina eximia. It is found primarily in the Hill Country area of central Texas. Southwestern black cherry is P. s. var. rufula and is found in the Trans Pecos and far west Texas. It occurs in deep canyons and protected bottomlands. Black cherry makes a fine landscape tree and should be used more. Herbalists recommend cherries and cherry juice for intestinal cleaning. Black cherry is an important food source for wildlife.